Camouflaged among the moss-covered rocks in the highlands and lowlands of Panama, the Limosa harlequin frog (Atelopus limosus) is difficult to spot even with its yellow clinging toes. These green-and-black-eyed amphibians leave their superb hiding places during the dry season and make their way to the fast-flowing streams of the Panamanian rainforest. Females lay their eggs in streambeds, where eager males wait to fertilize them. 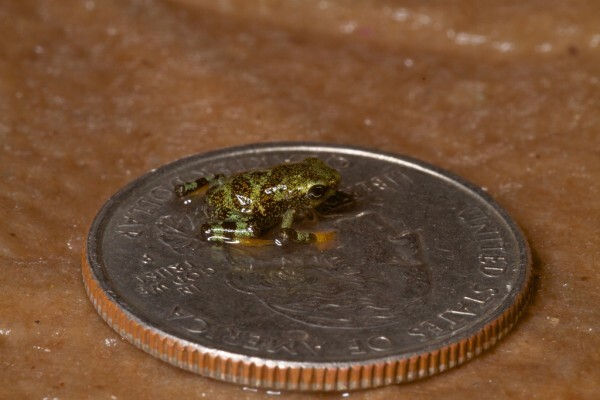 Laying clutches of eggs in faster-flowing waters may seem treacherous for the tiny frogs, but they brave the risk. 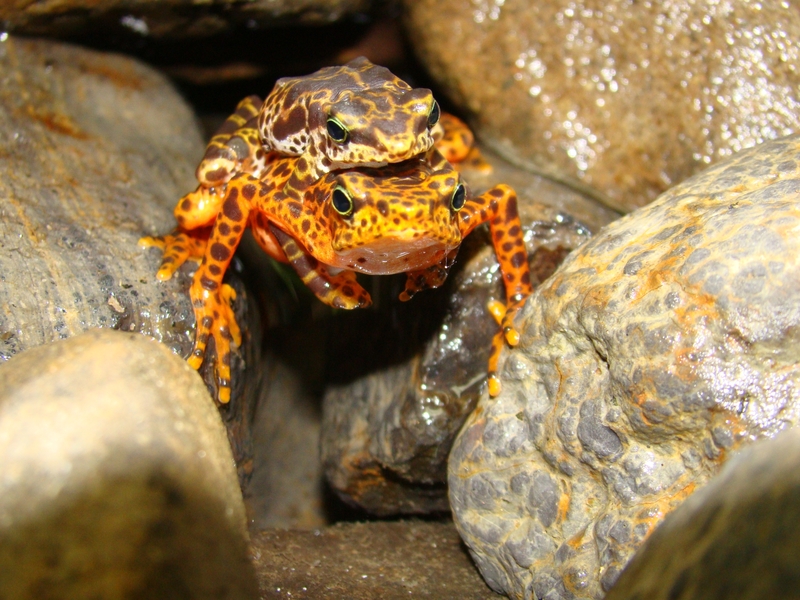 Eggs that are laid in those areas of streams are less likely to be preyed upon, or to face competition from other frog species. Limosa harlequin frog tadpoles are not left to be swept away by hurried streams once they hatch. Suction disks on their bellies help anchor them to the rocks in the streambeds. However, the species seems to be losing its grip in its fight to survive. It is listed as endangered in the wild and the population is still decreasing. It is facing threats ranging from deforestation to pollution. 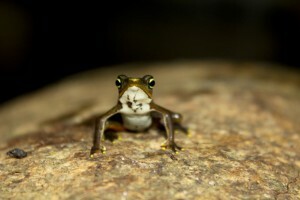 Those threats are compounded by the ravaging affects of the chytrid fungus. 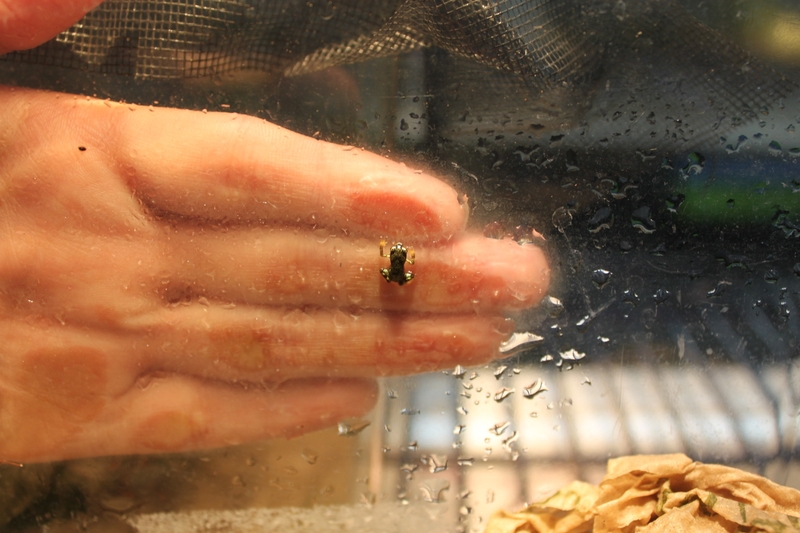 The Panama Amphibian Rescue and Conservation Project has brought the Limosa harlequin frog into captivity and is learning how to successfully breed them, giving hope for the survival of the species. 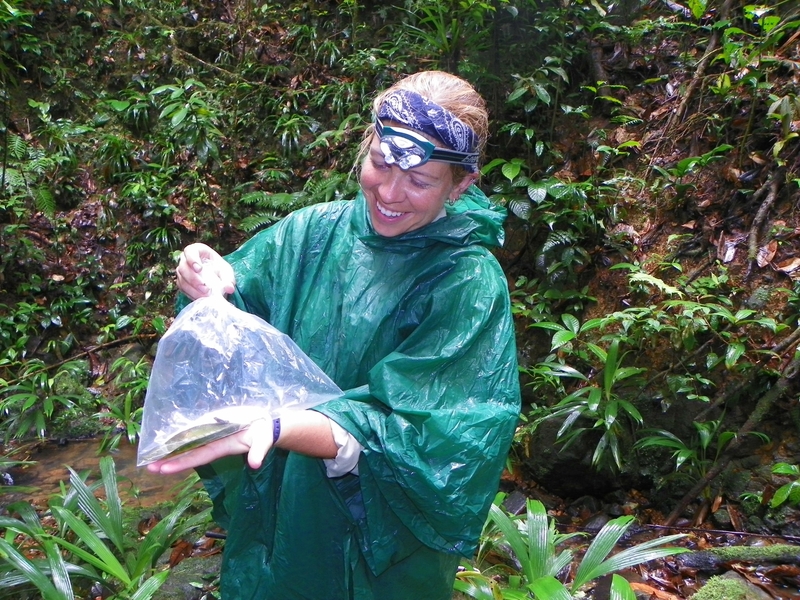 Wanted: Adventurous expedition members to hike into the jungles of Panama looking for the rare Atelopus limosus. Must be willing to hike long hours in rugged, muddy terrain and in thigh-deep water, and ready to be wet, hungry, tired, and not afraid of spiders, snakes, scorpions, and lots of insects. How could I pass up an opportunity to hike, explore, and camp in the jungle, all while helping save a species? This February was my first trip to Panama, however I followed the blog posts from other Cheyenne Mountain Zoo team members during previous expeditions to Panama, so I felt like I had already been there. I knew it was going to be a challenging trip, both physically and mentally. Would we find frogs? That was my biggest concern. 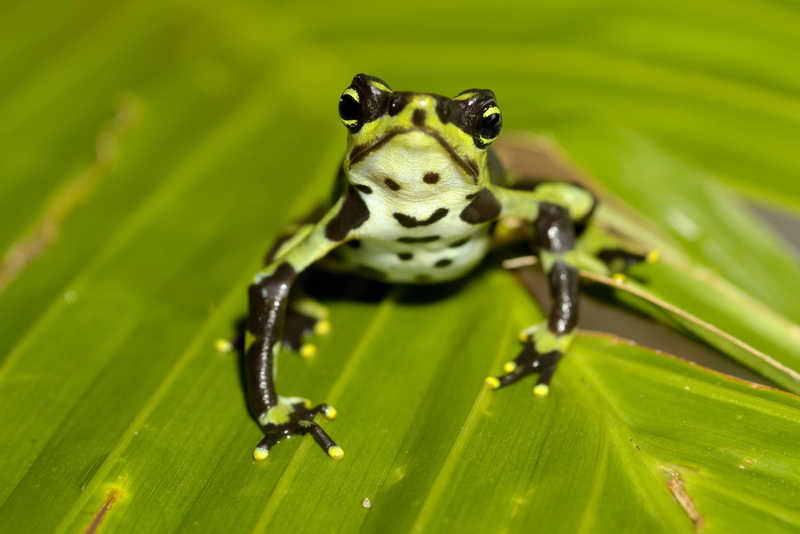 As we all know, the chytrid fungus is taking its toll on frog populations around the world and the rare Atelopus limosus is not immune to chytrid’s deadly sting. Atelopus limosus was our target species since the Panama Amphibian Rescue and Conservation Project only had one female and four males in captivity. The future of the species appeared to depend on our findings. 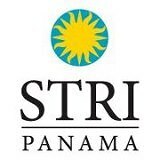 It was the “dry season” in Panama (although, being from Colorado, rain every day does not seem very “dry”!) and therefore, was the best time to find females, as they would be coming down to the streambeds to lay their eggs. The males would be there waiting. We hiked along the stream and carefully searched the moss-covered rocks for the small, highly camouflaged black and green frogs. It was tough to be quiet and sneak up on our target as we sloshed around streambeds, stepped over branches, and slipped on rocks. We paid especially close attention to areas of the stream where the water moved a little faster. 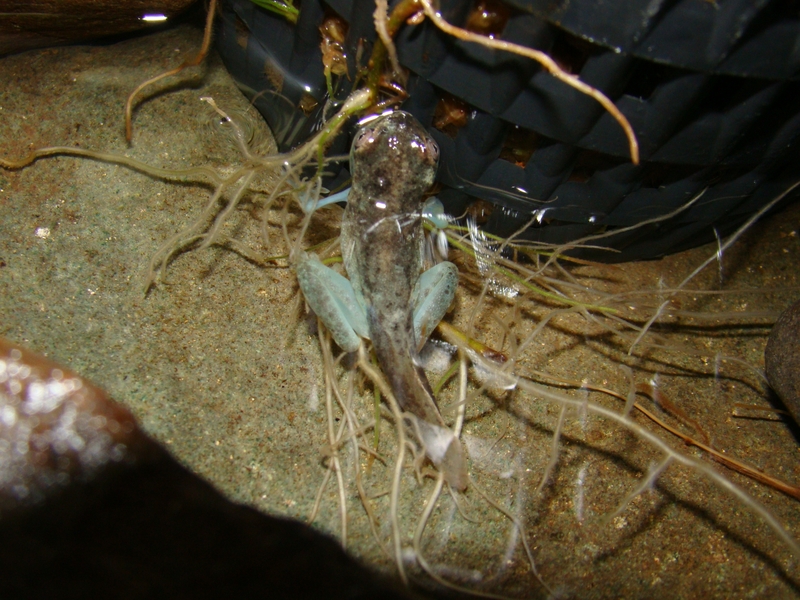 Atelopus limosus lay their eggs in faster-moving water to reduce competition from other frog species and reduce predation. The tadpoles are specially designed with little suction cup disks on their bellies to help them hold onto the rocks and keep them from being washed away. Pretty cool! Our team found just four Atelopus limosus during our time in the field, but we were able to give hope to the species as one of those caught was a young female. We handed off our precious cargo to the capable staff at the Summit Zoo, who take their job and role in frog conservation very seriously. 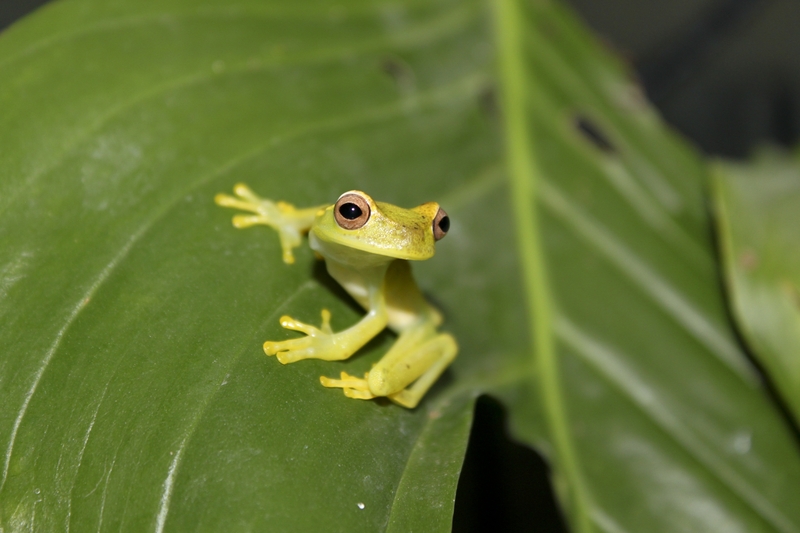 They are working hard to care for and propagate many other amphibian species besides Atelopus limosus to ensure the sounds of frogs continue to be heard in the jungles of Panama.